“Duck Face”, also known as “Myspace Face”, is a pejorative term for a facial expression made by pressing one’s lips together into the shape of a duck’s bill. It is often associated with self-gratuitous photos of teenage girls posted on social networking sites like Myspace and Facebook. The trend of Duck Face photos can be attributed to the emergence of social networking profiles, most notably with the launch of MySpace in 2003 and its rise to mainstream popularity in July 2005. 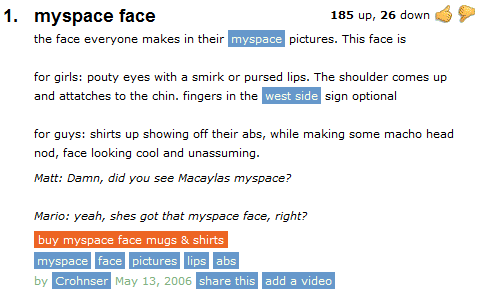 Myspace users could create profiles including biographical information and photographs of themselves, many of which exhibited the facial expression that eventually became known as the “duck face.” On May 13th, 2006, the first Urban Dictionarydefinition for “myspace face” was submitted by user Crohnser, which described the female version of the expression as a combination of pouty eyes and pursed lips (shown below). On September 13th, an Urban Dictionary definition for “duck face” was submitted by user Mair Mair, which defined the mannerism as a two-lipped pout. In November of 1979, a Little Feat album titled “Down On The Farm” was released, which featured a picture of a female duck wearing red lipstick on the cover (shown left). An episode for the television comedy series Full Housethat aired on October 13th, 1989 included a student who was nicknamed “Duckface” for making the pursed-lips facial expression. In the 2001 film Zoolander, the protagonist’s trademark “Blue Steel” look (shown right) has been frequently compared to the duck face. 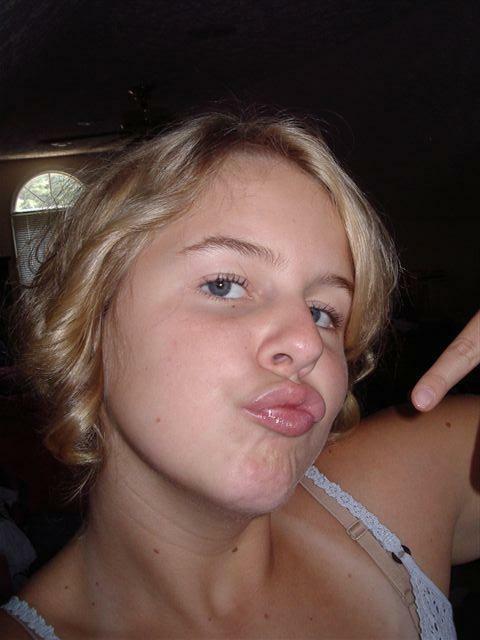 On March 29th, 2007, deviantArt user Hauntash uploaded a photo of a woman pursing her lips titled “The Duckface.” On January 27th, 2008, a gallery of photos titled “The Ugly Duck Face” was submitted to the Internet humor site Ebaumsworld. On June 21st, YouTuber benlyons83 uploaded a music video featuring a slideshow of duck face examples with the song “Duck Face” by the comedy music artist Gamble. On September 23rd, 2011, American actor Nick Cannon published a post to his official blog titled “Duck Face Fails”, featuring several duck face photos. On February 28th, 2012, BuzzFeed contributor brndib6 submitted a post titled “Duck Face: The Race for the Cure”, which included example photos with captions describing the pose as a disease.